San Francisco is a hub to many changes in society and living, what comes next is beyond that in every way as a mysterious rock shifts the course of the residents in a radical direction. Not exactly what you would expect from a reality tv themed comic name but it’s what they’re delivering. 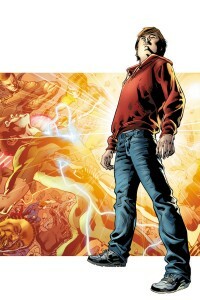 The new comic from Jonathan Ross and Bryan Hitch pits children born from this massive event against each other in the hottest new reality series for the chance to become a Hero. Okay so that’s half-true, it’s a private funded program to teach, train and examine the genetic background of what makes this possible in this pool of young fighters. The research has been going on for years and could reach a head soon with results that would allow them to return to society but such a thing is cut short by the higher powers. While these powers were not a primary source of income, the show itself is their main front to get funding through ratings, merchandise and promotions from the intense situations all of these candidates face. For fans there are only 4 top heroes, The Quarterback, Blur, Whispa and Ice, these top heroes await their newest team member to arrive out of the new competition so they can lead a new generation. Unfortunately our narrator Tommy Watts is not part of that elite group of super powered beings, he’s a clerk that walks us through the start of this story and soon finds himself drafted into the middle of it, not only as a low-end merchandise clerk but soon as a focal point to the show and the world. Sometimes it’s the most unexpected figures that deliver the biggest results in a world like that, Tommy proves it to be true in this opening story as we see a guy working a 9-5 hating his job shoot forward to the highest tier possible. The story is a bit of a shift it breaks itself up into the Tommy, America’s Got Powers and the dark figures looming far above the stadium calling the shots on all of this. The three narratives do cross over each other during the course of the issue and by the end of it we see it all coming together for a single punch in issue 2 after all hell breaks loose in the arena. It’s a casual story-line that turns to deliver a hard cross at the last second, with extremely detailed art and original environments coming from the team it’s easy to get lost in the drag that Tommy experiences and then feel swept up as the pace of the action and story move quickly with little notice. As an original series and a mini-series there is some potential to be had, given their control of the first installment it seems safe to expect Ross and Hitch to continue delivering strong entries into this series. Rick and crew haven’t been having an easy time for a long while now, The Hilltop is proving to be no different in any of this. With Gregory the leader going down as a message from Negan we see Rick pulled into action yet again by reacting to save Gregory and in the process killing the man who assaulted the leader. In the middle of this new community he’s left to face judgement even if it was an act of self-defense, shocked and isolated the people see a villain in their midst. Turbulent times kick off things right away, the shock of death is a heavy hit for all of the community. Instead of seeing Ethan as a threat he was part of their people and Rick for his actions plays the role of the murderer and villain to them. Weapons drawn and nervous tension surrounding him, Rick will not compromise to their will, instead he stands firm until Jesus comes between them all. It sets the tone for the rest of the issue, they’re the newcomers and now they’re also seen as a threat to their community even if what they did was justified in the moment. 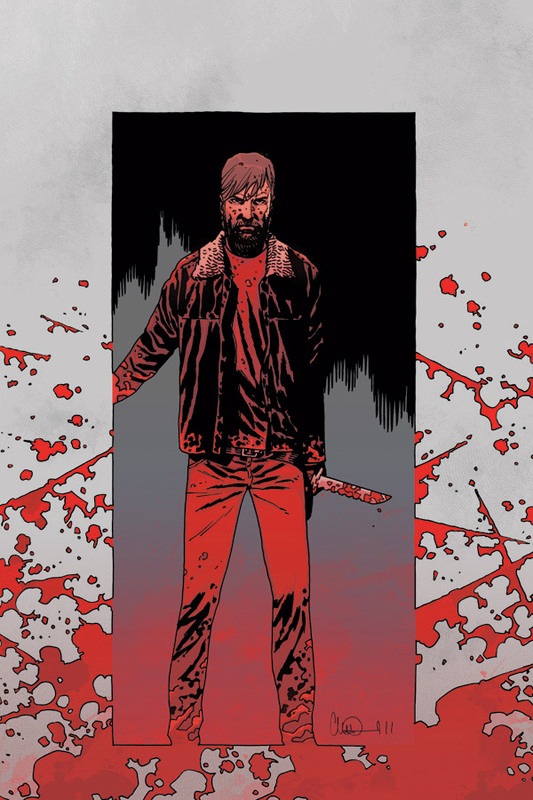 The world of The Walking Dead is about to start into a new phase with this issue, everyone finds a little something to appreciate about The Hilltop and a strange sense sweeps over them. After so much stress and horror on the road and going from camp to camp there’s a strange calm or refreshing warmth that hits the group and it passes through from the pages to the reader in the middle of the chaos. Fortunately the TWD team isn’t this forgiving, this calm comes at a price, as they’re not the most capable farmers or the richest in supplies they have to bring their own way of contributing to the table and there really is only one true thing they do well in this world. Rick and his team have a mission, it will not happen overnight or even in a few days but it will be one that they can embrace and give it their all for. Given how hard Rick and crew have had it through these last arc’s, it’s really something to see a remote shred of stability coming back to them, it could be a hard period for them with low supplies during a hard Winter for the group. The folks behind The Hilltop have made it a little easier and a little less stressful, what rests ahead is a choice on how they repay this kindness and a test of integration into the community, they need to be one but at what cost? The art is crisp and the pages deliver some critical shots, Carl resting on the roof of the car as lookout, Rick’s empty stare after killing Ethan. The pages push the atmosphere in each shot even without color to support or direct attention, they’ve been at it so long they’re able to deliver the emotion each time on call. 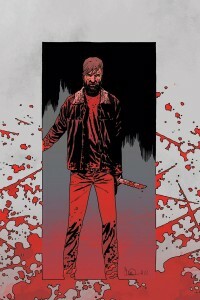 What rests ahead according to Kirkman is a new challenge to Rick, coping with life in such a large world once again. We know he has a battle coming but he also has a desire to make this place home as well, can he balance the need to fight and desire to try to settle up after all this? 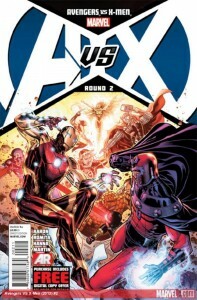 Avengers vs X-Men #1 left off with Cyclops blasting Captain America for wanting to take Hope Summers from the X-Men, as an estimated target for the Phoenix to reside in they’re out to make sure the Earth isn’t destroyed by the force. Given their approach in a giant flying battle ship though and loading up with their full team it was reasonable to expect a negative reaction to this attempt. With both sides gearing up for battle it’s going to get nasty really fast. 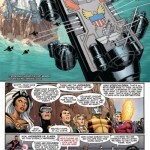 Issue 2 takes us into the heart of the battle, the stage has been set and Iron Man calls the Avengers into action as the X-Men brace for impact on their island. Taking Hope out of their hands is not an option and the team will do what it takes to protect her and potentially the future of their kind from being wiped out by outsiders in this new showdown. It’s an epic battle in the pages that follow, marriages torn apart, old friendships smashed and bodies and bones fractured all over in a super battle for the planet or Hope, it gets confusing. 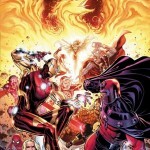 The final pages of AvX #2 leave a lot of worry on the minds of the reader, as the Phoenix Force closes in Hope becomes more and more unstable, with the conflict right at her doorstep she moves from a reserved state into the forefront. She’s the biggest gun the mutant world has and she’s not going to sit idle anymore while those she knows take beatings or risk their lives for her. She knows what she has to do, and no one is going to get in the way of it once she embraces the power and puts it into action, something Logan should have thought about before picking the side he did. 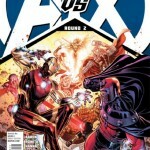 Avengers vs X-Men #2 is a blast of story not just in narrative but in dialogue as well, we get a taste of what everyone is going through in this battle and that in the moment of action everyone is forced to pick a side and stand firm with it. It wasn’t the prettiest start but the line was drawn and everyone owns their decisions even if the thoughts race their minds with some doubt. 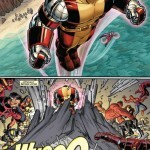 The art team helps supplement this by adding extra emotion and energy to each panel, the characters showing signs of distress and frustration and pain as they slug it out across the beach. Even Iron Man in his shell shows that he’s not beyond a gesture of struggle or trauma, when Emma slams her diamond fist into his gut he’s completely lifeless for a moment. It’s an evolution from the original issues and it looks to build strong momentum as we head into the next round. Check out the preview pages below and the cover art for more goodies on this issue. 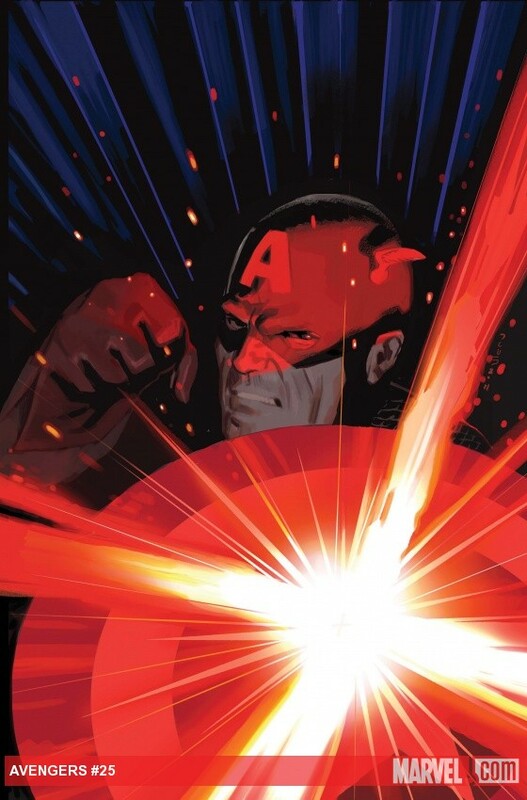 Avengers vs X-Men spills into the pages of The Avengers #25, the fight is on and then we shoot back into the memories of Captain America. Unfortunately yes, we’re in another back story sandwiched between minutes of the fight breaking out. This isn’t to say it’s irrelevant in the story though, in fact it’s a chunk of a huge story panning out for the arc . We’re given a glimpse at Captain America in this struggle, it’s not one he’s all that accustomed to though, he faces issues of public perception and doubts in his own mind about his ability to deliver. No one ever said being the face of a super hero group would be easy though, even his allies remind him of that as he wishes for that one move to put them back in the good grace of the public. Issue 25 takes us into the heart of Cap’s doubts and desires to deliver a win for the people, with the help of his fellow Avengers and a streak of luck delivered by Noh-Varr they take on a piece of the puzzle that delivered such a heavy blow to the image of the Avengers. 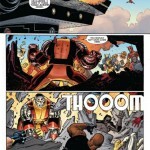 With swift action and coordination Captain America is able to relive the good moments of this job, tackling A.I.M. and renewing faith in his team to protect the world in a way they only can. It’s a deep side story that really drives off from the Phoenix issue at hand, that is until the end of the issue and then you find out yet another interest rests under the surface of this conflict. Who else in the Avengers will develop a new agenda as they come to this fight and how will it spiral out for the team? 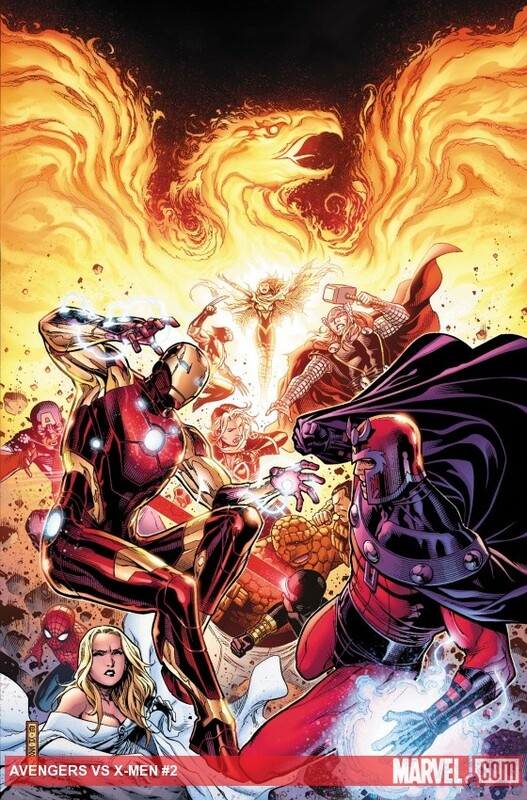 For those hoping to see a dramatic battle in Avengers 25, you’ll get one but it will not center around the X-Men, instead the focus shifts over to A.I.M. and it’s an important step to introduce a greater issue at hand. It’s a shame to see so much back peddling but understandable given where this story is directing itself, what was originally a battle to save the Earth from the Phoenix force is now developing into a galaxy wide battle to control it. We’ll have to see how well they can keep it together when they start to wonder who they can really trust. Outside of the story, the rest of the issue is a good read, although I still struggle to see why Thor came off so odd, his face almost too flat to imagine as he flew in to lend a hand to Captain America. So much of the book went fine minus that moment and it was so large of an exposure that seemed to never repeat itself after the fact.